Dog Bed King Cuddler Nest Pet Bed. Brown Denier Exterior With Imitation Lambswool Interior. Inside Dimensions : 38 x 28 x 7" Please Measure Your Pet For Proper Fitment. Fits One X Large Pet Or Two Medium Size Pets. Our Largest Pet Bed Available. Elastic Hem For Ease Of Removal For Machine Washing And Line Dry. 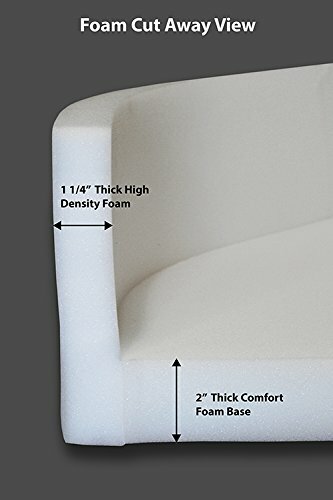 Features Our New Foam Bottom Protector. Your pet will love the original Cuddler Nest Bed which can Only be found at Dog Bed King USA. The unique cuddler nest design provides a supportive, curved solid-foam collar which matches your pet's natural sleeping position. Combine this design with a comfortable 2" thick comfort foam base, 1 1/4" thick solid foam wall and thick, soft lambswool (imitation) and this bed will be your pet's favorite. All Dog Bed King USA products are manufactured in Frankfort, IL with high attention to quality that you and your pets will enjoy. Made In USA Dog Bed King Cuddler.